According to AND 2015 double-hull spaces and cofferdams shall be provided with ventilation systems. If necessary, the empty cofferdams spaces will be filled with water. By filling and emptying, at temperature and atmospheric pressure differences, air will be exchange between atmosphere and cofferdam space. 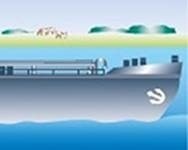 If the shipload requires explosion protection, than gas air mixture can accumulate in to cofferdam or double-hull spaces. To prevent explosion in the cofferdam and/or double-hull spaces, the ventilation system must be fitted with end of line deflagration flame arrestor approved to EN ISO 16852 (see also ADN 2015 - 9.3.2.20.4). Flame arrester means a device mounted in the vent of part of an installation or in the interconnecting piping of a system of installations, the purpose of which is to permit flow but prevent the propagation of a flame front. This device shall be tested according to the European standard EN ISO 16852:2010. The flame-arresters prescribed in 9.3.2.20.4, 9.3.2.22.4, 9.3.2.22.5 and 9.3.2.26.4 shall be of a type approved for this purpose by the competent authority. When the list of substances on the vessel according to 1.16.1.2.5 contains substances for which protection against explosion is required in column (17) of Table C of Chapter 3.2, the ventilation openings of cofferdams shall be fitted with a flame-arrester withstanding a deflagration.